Walk-in date: For Telangana – 26.03.2019, Andhra Pradesh – 27.03.2019, Tamil Nadu – 09.04.2019 , Karnataka – 11.04.2019 , Kerala – 17.04.2019. Educational Qualification: Candidate should complete Degree from a recognized institution/ University. Age Limit(As on 01.03.2019): Minimum 18 years and Maximum 35 Years. 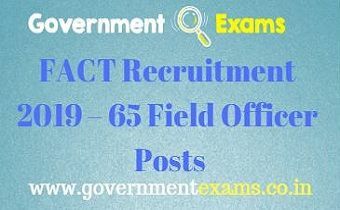 Click here to view official notification: FACT Recruitment 2019 official notification.